Protests over the cost of bread might have killed 22, as censorship grips citizen and established media. “The protests are about much more than to protest against bread price,” he said in a briefing to the Sudanese press. This comes one day after Gosh himself established strict censorship methods in the country, asking for NISS to be consulted before any paper going to press. The intelligence head accused rebel leader Abdel Wahid al-Nur of using the protests to carry out violent attacks on government property. He also gave the media a scoop on a contingent of rebels that had just returned from Nairobi, saying some of them had been recruited by the Israeli intelligence service. The Mossad does not comment on its operations abroad, but very little credence could be led to the claims. According to the New York-based Committee to Protect Journalists, there were also multiple reports of disrupted internet service, especially for social media sites. While officials give a lower death toll, Mahdi said “22 people were martyred and several others wounded”. He gave no further details regarding the death toll, which could not be independently verified. Two demonstrators were killed in Atbara and six others in Al-Qadarif, officials had said Thursday, as protesters torched offices of President Omar al-Bashir’s ruling National Congress Party (NCP). According to witnesses, demonstrations spread on Saturday to several more cities. 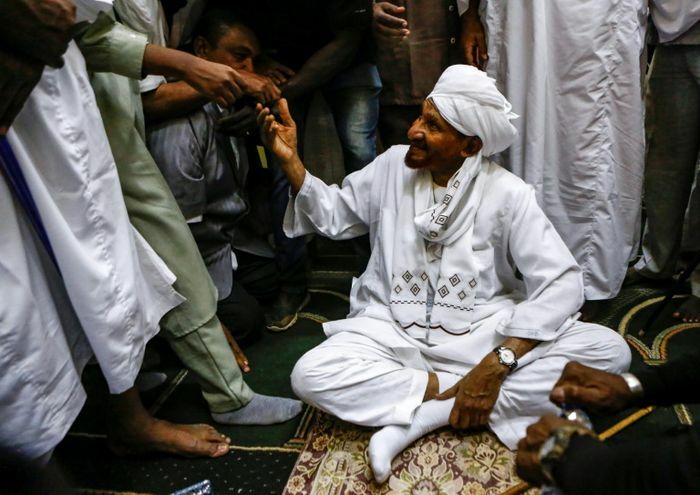 Around 300 people gathered in the centre of Wad Madani, south-east of Khartoum, “chanting ‘the people want the fall of the regime’,” one witness told AFP by phone. Police responded with tear gas and by hitting the protesters with batons, he added. In El Rahad south-west of Khartoum, hundreds of demonstrators shouting “no to hunger” were tear gassed, while administrative premises and the office of the NCP were set on fire, according to another witness. North of the capital in Al-Obeid protesters clashed with police who fired tear gas, witnesses told AFP. Government spokesman Bashar Jumaa had on Friday warned that authorities “will not be lenient” with those who set state buildings on fire or cause other damage to public property. Opposition members have also been detained, according to Sadiq Youssef from the National Consensus Forces alliance. He said 14 members of the coalition including its president, Farouk Abu Issa, were arrested as they left a meeting. The arrests could not be officially confirmed. A presidential adviser, Faisal Hassan Ibrahim, said the latest protests were being manipulated by “organised entities” without naming particular groups. He said two of those killed in Al-Qadarif were military in civilian clothes. Also on Saturday, Sudan’s national news agency SUNA reported that Bashir appointed a senior officer from the powerful National Intelligence and Security Services (NISS) as governor of Al-Qadarif. Mubarak Mohammed Shamat will replace Mirghani Saleh who was killed in a helicopter crash on December 9, SUNA said.